NYC vector graphics of various icons representing symbols of New York and famous places in the Big Apple. Silhouettes of tall buildings, monuments, labels and text. Free vector icons for all kinds of company logos, stickers, decals and poster decorations projects. 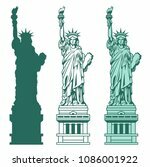 Download New York icons for your USA and traveling projects. Tags: America, Big Apple, Cab, City, Nyc, Statue Of Liberty, Taxi, Usa.